A really good movie. After i came home, i found out the director was the same who made the Bourne trilogy. No wonder! It kept me on the edge of my seat the entire time. Amazing actor from Hanks as well as the supporting actor, excellent editing, and impeccable story telling. A very satisfying experience. 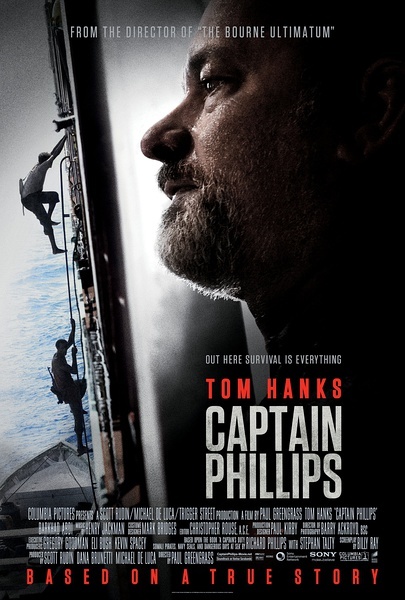 I’ve spent the evening reading up on the Somali Pirate situation wikipage (turned out Indian Navy has been capturing, defeating the most Somali Pirate hijacking in Gulf of Aden), interviews with director Greengrass, Tom Hanks, Barkhad Abdi–a first time actor and a Somali-American, and interview with the real Richard Phillips. I even started readying the real Richard Phillips Memoir “A Captain’s Duty: Somali Pirates, Navy SEALS, and Dangerous Days at Sea”. All the scenes of the movie was shot on real ships, Greengrass ensured they were of the same model/type of ship as in the real story, from the Cargo ship to the Navy destroyer. They shot the movie off the coast of Malta. The four main pirates were all Somali-American who now live in Minneapolis, where there is a large Somali community. And the four were friends in real life when they auditioned. The other Somalis in the film were recruited from UK. Greengrass also kept the US cargo ship crew actors separate from the pirate actors until they shot the real scene of their encounter. Tom Hanks mentioned their first meet during shooting, when the four got onboard of the ship and shoot their way to the bridge where “Captain Phillips” were at the time, “these were the four skinniest and scariest people i’ve ever met in my life.” Hanks said in the interview on Fresh Air. Hanks and the other two crew on scene also didn’t know what they were shouting at each other in Somalian.